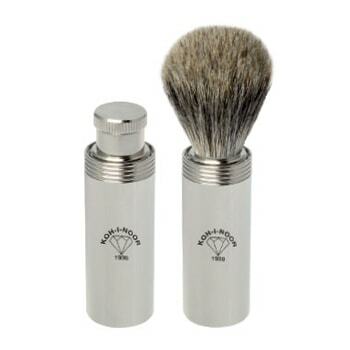 Made of chrome with pure badger hair, great for anyone new to wet shaving, lathering, and the wonderful properties of badger hair. It excels in water retention, backbone, and face feel. It whips up phenomenal lathers and the individual hairs are somewhat thicker, but still soft and flexible. Bristle Loft: is this the same or does it vary? Care: After use, rinse the brush in warm, running water to remove all traces of lather. Then flick the brush over the sink to shake out most of the water and then gently drag the brush hairs over a towel. Finally leave the brush hanging in a stand upside down where air can circulate and aerate around it to dry the brush completely. Occasionally, wash the brush in a normal hair shampoo product with focus on cleaning the knot at the base of the brush so no excess residue stays there. Never mass-produced, each brush is made by an artisan’s hand. Badger hair is an exceptional material with excellent water retention and softness. The handle is made from chrome. My wife got me this shaving brush for Christmas and it’s like piece of art. I really enjoy shaving now and my skin never looked so good. When you want an amazing shave, it’s all about the tools. And, this brush lasts for years.